As some of you know I hatch, feed train, and grow out gamefish to trophy size for the taxidermy and replica fish industry and I'm a fish taxidermist myself. I've done everything but beat fish farmers over the head to show them this is a viable sideline for their fish to no avail. Finally decided I had to do it myself about a decade a go. One type of customer is the taxidermist that needs large natural specimens to mount for state, national, and world competitions. As those of us that are anglers know you can't just go out anytime and catch a trophy fish in public waters unless you are lucky enough to live somewhere where that is common place. The following two fish won first place at the national level. 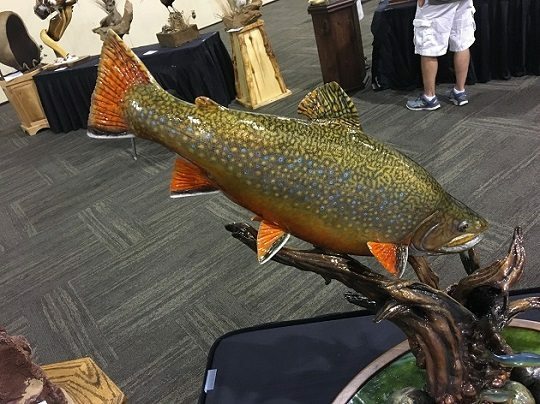 The very latest is this brook trout raised in my trout pond and mounted by Mickey Bowman of Oklahoma. 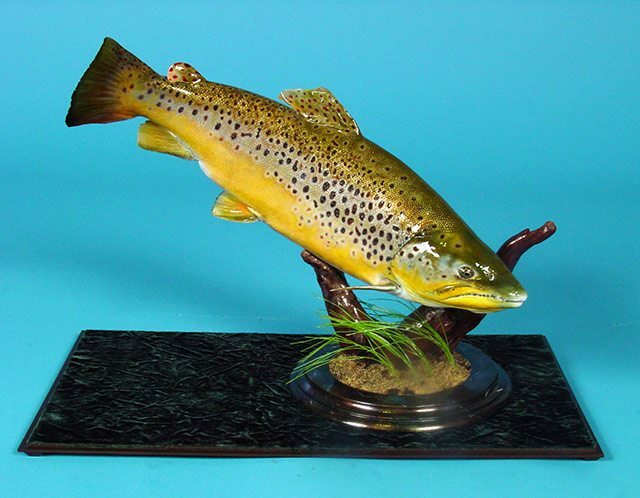 This brown was also a first place fish a few years ago and mounted by Frank Kotula of Pennsylvannia, USA. Needless to say I have a waiting list for large trout and run out of them very quickly. There is some amazing work out there but a lot of stuff that makes one cringe when one sees it. I do a fair amount of repainting of other's work that is pretty dismal. On a funny note was doing a presentation several years ago when I was president of my state aquaculture association. One guy from Purdue made the comment, "We heard you don't do much in aquaculture." Kind of insulting but I'm sure it originally came from one of the academics there. Ironically my fish prices are second only to high end koi farms in Japan. I may not have the numbers but I get at least $40.00 each for my fish going up to $250.00. I run out of trout in a few weeks. I figured at 700 trout if I sell them all at $40.00 minimum (they usually go for more) I've got $28,000 worth of fish in that 1/10th acre pond. I will be moving most of them this fall into a much larger pond. So much for "I hear you don't do much in aquaculture." Got a couple of Great Blue Herons hanging around the pond even with running them off with bottle rockets and staked lines around the pond. I saw one with a trout in his mouth as I ran him off. I hate killing things but I've done everything non-lethally possible to discourage them. Looks like a permit from U.S. Fish & Wildlife for $100.00 to take a couple out is my last option. What a shame but I have to protect my investment. The profit will be my new pole building in a year or two. Form 37 is on it's way to apply toward a state permit and then the U.S. Fish & Wildlife Permit. Will be running off the birds for couple more weeks. I've thought of that. How difficult would it be to get it really taunt over the pond without it falling into the water? The pond is 59 by 85 feet. I'd actually prefer to do that if it was effective vs. killing them. Poles made of bamboos or any other wood are used as stakes in between. You can use galvanized iron also. Usually the bird's net over larger pond is done in summers here when water level is low or when pond is dry. Thanks. I will look into that for next year. In actuality it would not have to be over the entire pond. Just out a few feet from the edges and out over the water would work as these birds do not land in the water but wade in. That said it would have to be set up where they can't stand on the netting to fish over the edge. So perhaps it would be better and easier to just cover the pond. I had a bird one night in another pond standing on an extension cord to a night light that was used to attract yellow perch fry for feed training. These birds are really amazingly intelligent! New bird showed up at the peak of the solar eclipse. Osprey aka Fish Hawk. Hopefully passing through as I did not see it at all today. An Osprey may log more than 160,000 migration miles during its 15-to-20-year lifetime.